The latest addition to my website is Hwang Sok-yong‘s 해질무렵 (At Dusk). This is a superb book about an architect who, though successful, is a bit lost in his life, his wife having left him, his friends dying and his increasing concern about declining values. He receives a note asking him to phone a number – that of his old girlfriend he has not seen for years. At the same time we follow the story of a twenty-something would-be theatre director and playwright. It is not going well for her and she has to supplement her income working the graveyard shift at a convenience store. She has an enigmatic friend, whose mother she meets, but considers her life hopeless. These two stories eventually merge, of course. 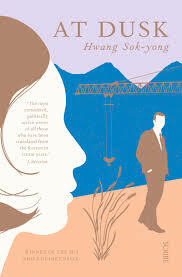 Part of the novel is about the changes (for the worse) in South Korea over the years and part simply about two people who are struggling to fit in.